Those anxious to see what it will be like to have Stephen Colbert take over David Letterman’s chair need only wait until next Tuesday, April 22, when Colbert visits the Late Show, and viewers use their imaginations to transpose him approximately six inches to the right on their TV screens. 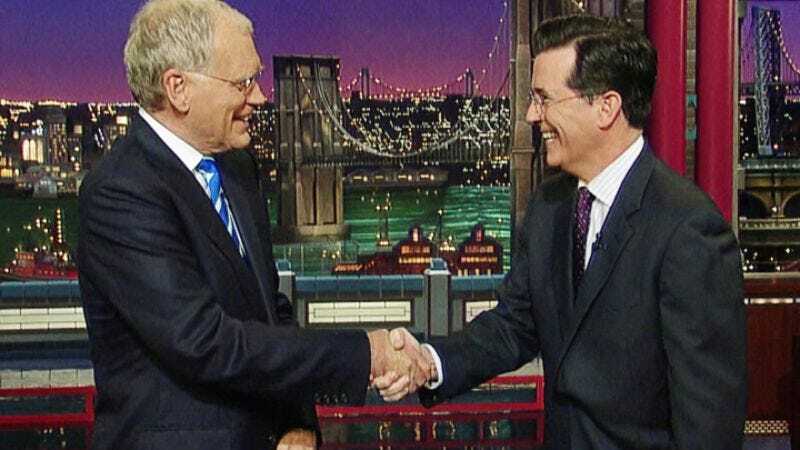 As Colbert ever-so-subtly edges to his left, furtively taking measurements with his eyes, Letterman will give him his first interview since accepting the job. It’s an exchange that will surely be marked by many gracious expressions of mutual admiration, some good-natured ribbing, and the incipient beginning of CBS’s savage war on America’s heartland. There will probably also be some jokes about leaving Paul behind.